In order to be eligible for membership in the Greater New Orleans Council, you will need to first join our National Navy League at www.navyleague.org and click MEMBERSHIP to fill out application. You may also contact the office at 504-522-8946. Its a great time to support our local sea services--Navy, Marines, Coast Guard and Merchant Marine members. 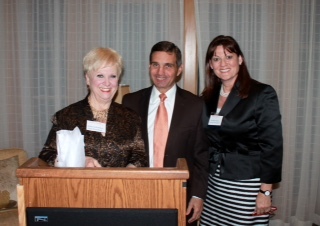 Our Community Interest Dinner was held on March 26th at English Turn Country Club. Pictured from left to right: Bobbie Whiddon, Area President, New Orleans Council Navy League ; Leon Cannizzaro, Orleans Parish District Attorney ; Brenda Davis, President, New Orleans Council Navy League. The United States Sea Cadets Corps, Eisenhower Squadron of NAS/JRB, held their annual awards ceremony at the World War II Museum on April 10, 2016. Among the awards presented was the Teddy Roosevelt Youth Achievement Award and the Navy League of Greater New Orleans Bobbie Whiddon Leadership Award. 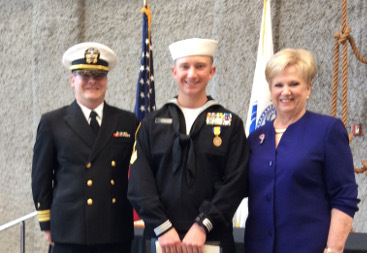 Pictured is PO1 Conner Pichoff, (center), who was awarded both honors. Also pictured is (L) unit Commanding Officer, LCDR Shawn Turpin and (R), Bobbie Whiddon, who represented the GNO Navy League. On September 28 2012, Tenney Flynn, executive chef at GW Fins in New Orleans, demostrated dishes on board the USS Louisiana. Articles located at NOLA.com and Navy News websites. On Tuesday, June 3rd, 2008, the USS NEW ORLEANS reconnected with her namesake city. With the support of the Navy League of New Orleans, Chefs Greg Collier (executive chef of Redfish Grill, New Orleans, La) and Darrin Finkel, (executive chef of Jazz Kitchen, Anaheim, CA), strapped on aprons in the ships galley. 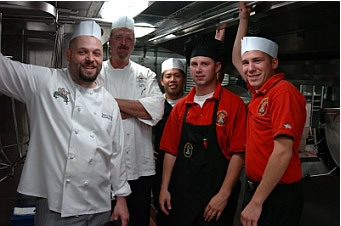 Together with the ships Culinary Specialists, they treated the crew to some mouthwatering Cajun cooking. Catfish Courtbuillion, Cajun Pork Grillades, and Creole Jambalaya made a welcome break from the 21-day menu. Mardi Gras beads and other Bourbon Street memorabilia adorned the mess decks, and DJ Drew Miller of 88.3 Jazz FM served up toe-tapping Cajun and Creole tunes. Commander Brad Skillman, the ships captain, thanked Greg and Darrin for a most memorable and delicious meal. Q: How does it feel catering to military personnel? A: We feel good that we were able to give the New Orleans crew a nice meal and just try and return the favor of giving to you because we could never do as much for you as you do for us and the country. Q: How was it working in a Galley and supervising in the Mess Decks? Is military jargon/equipment/ procedure any different from a 4 star kitchen? A: Working with the crew was great! I almost wish that I could take some of the guys back with us, but Uncle Sam wont allow that. The only real difference is the equipment, there were no burners and a couple of other utensils. Other than that they clean up directly after meals, are prepared, and are very organized. Q: Coming into this what were your expectations? What will you take from this experience? A: We really didnt know what to expect and that was the exciting part about this entire experience. We truly believe that the adopt a ship program is really beneficial and we think that it should be continued. We learned a lot about how the ship works and what it takes to cook for this amount of people day in and day out.